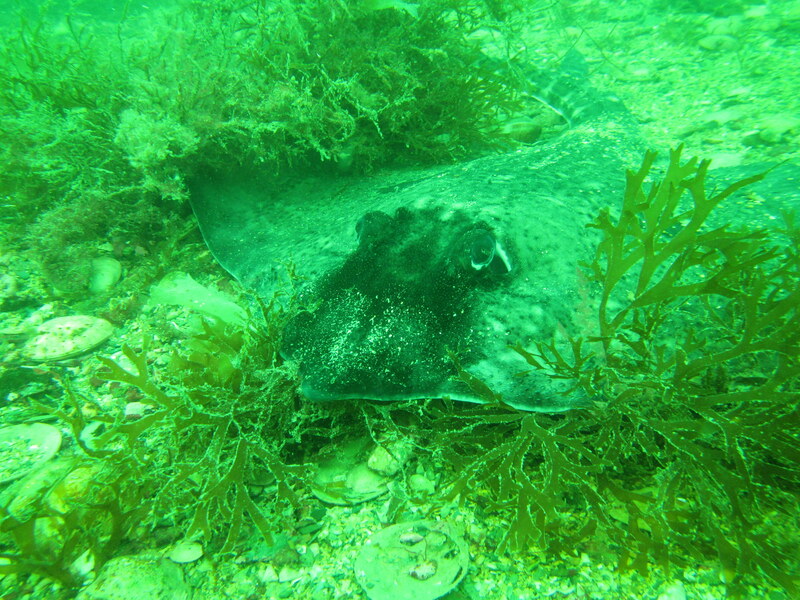 A quick post on a dive a couple of weeks ago, my first boat dive in Cornwall. 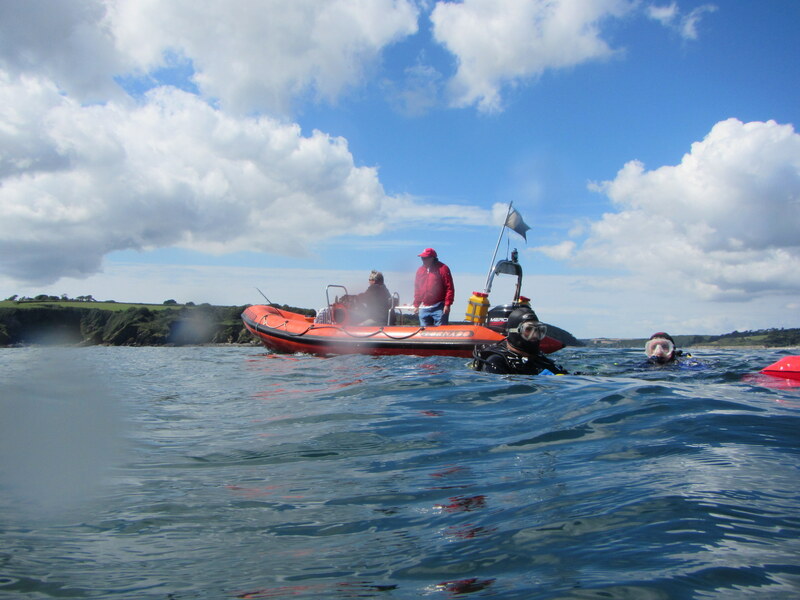 Four divers left from Loe Beach in Feock on the Fal Estuary to find the wreck of the Rock Island Bridge at the mouth of the Helford River. On our way we saw a Harbour porpoise which was a first for me, great! The mouth of the Helford is only slightly deeper (nine meters) than it is off Grebe Beach where we usually dive. There is no eelgrass here, just some Divided net weed Dictyota dichotoma and very large Sugar kelp Saccharina latissima lying flat on the bottom. The seabed is an expanse of gravel covered with quite a lot of bivalves: Great scallop Pecten maximus, Rayed artemis Dosinia exoleta, Norway cockle Laevicardium crassum, Dog cockle Glycymeris glycymeris, Common ottershell Lutraria lutraria, Warty venus Venus verrucosa, Pullet carpet shell Tapes corrugata and Hardshell clam Mercenaria mercenaria amongst them. 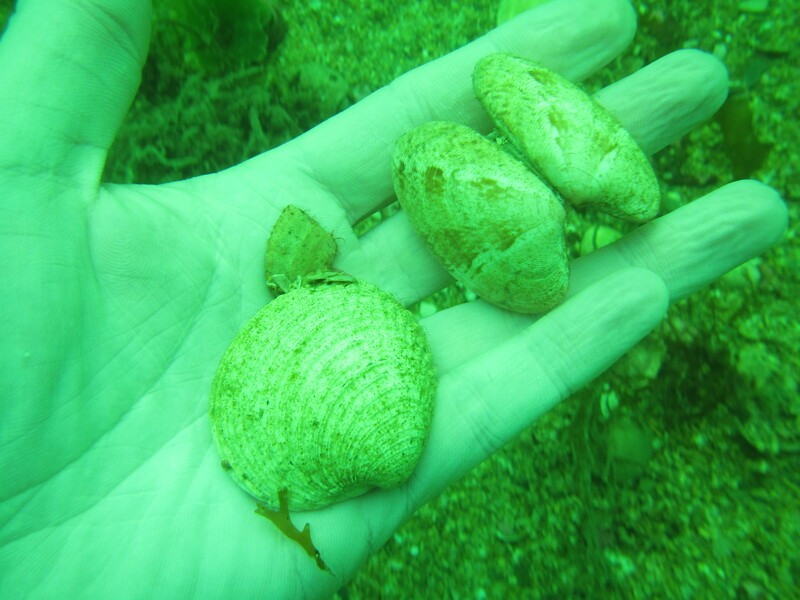 Next time I will collect shells so I can take a good picture of all of them back on land. 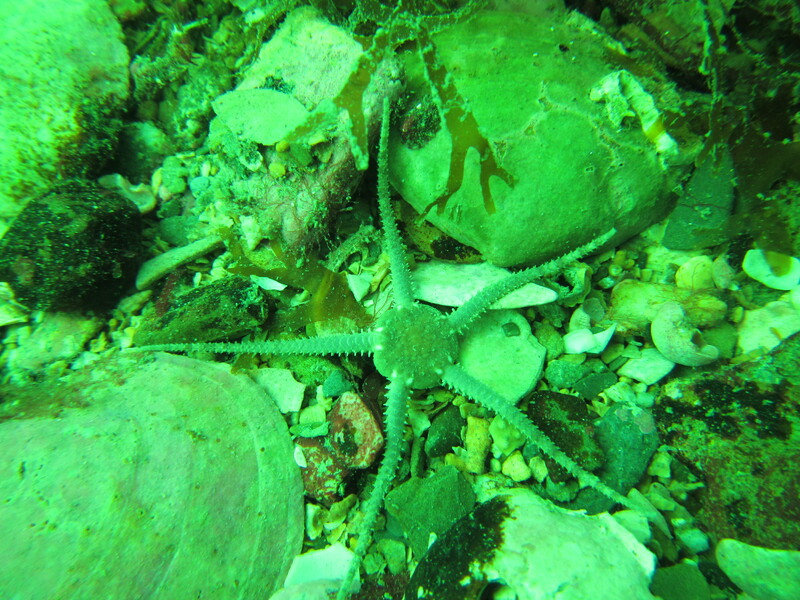 The place was swarming with starfish feeding on these bivalves, I’d say 90% Common starfish and 10% Spiny starfish. Below a Common starfish Asterias rubens feeding on a clam, a small brittlestar Amphipholis squamata and a Warty venus and Pullet carpet shell. 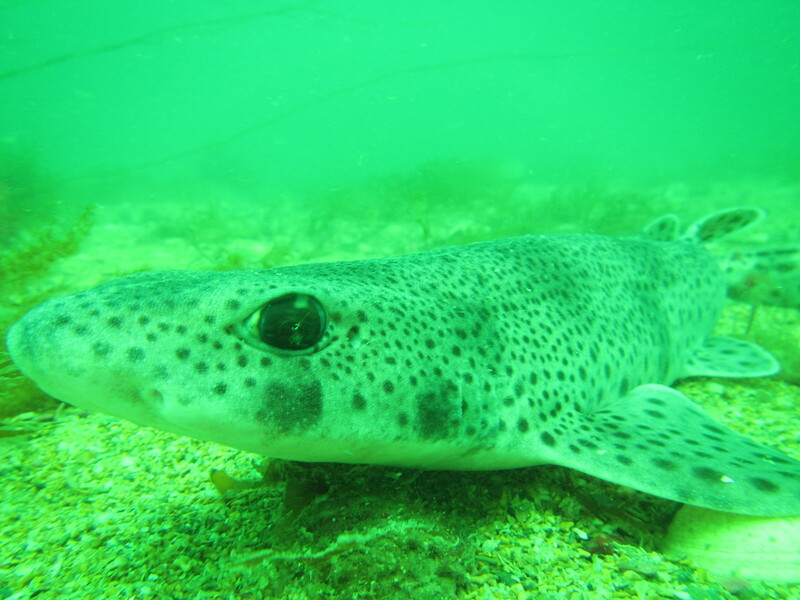 Although the seabed was relatively featureless and we did not manage to find the wreckage, it was fun to watch the Thornback rays Raya clavata (including a large individual with distinctive black headmarkings) and the many Small-spotted catsharks (or dogfish) Scyliorhinus canicula which are very easy to approach. 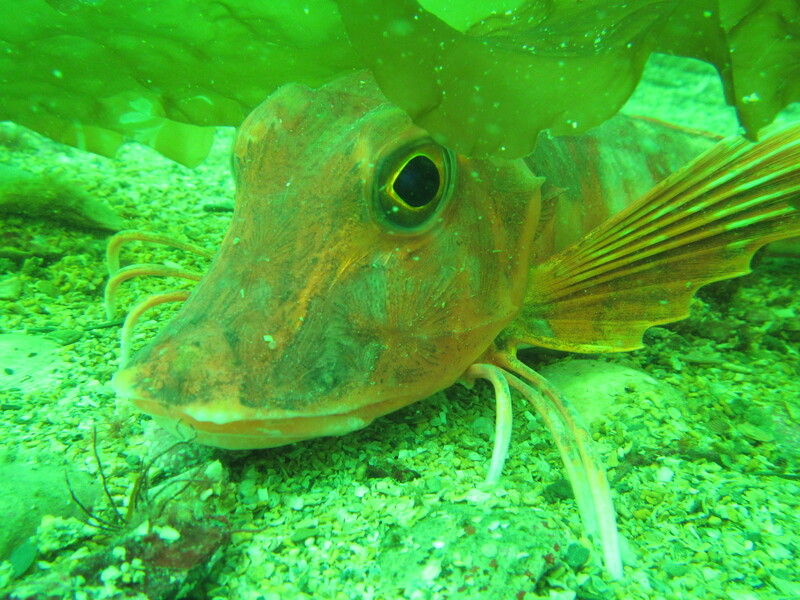 We also saw a Red gurnard Aspitrigla cuculus (see also this old post). However, it is high time we are going to explore some other, deeper dive sites. 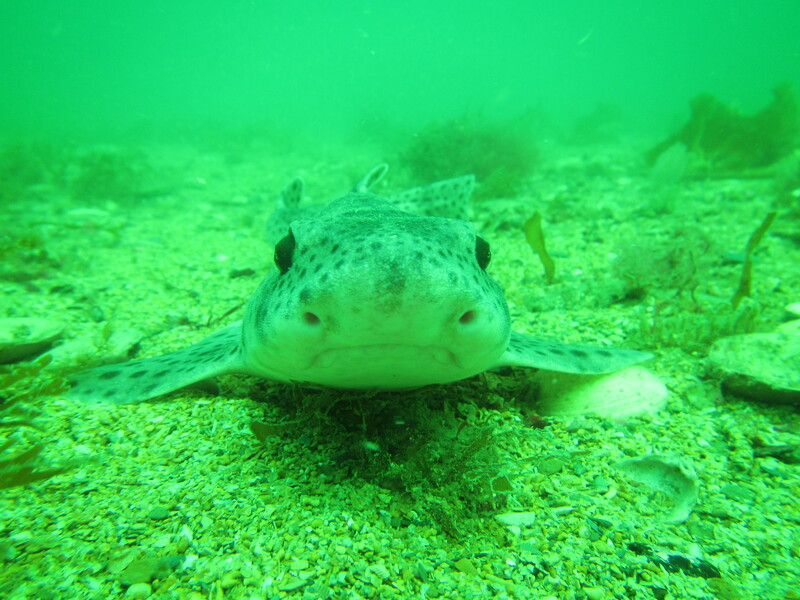 With the weather deteriorating, I hope we can find some more good days to dive this year though! 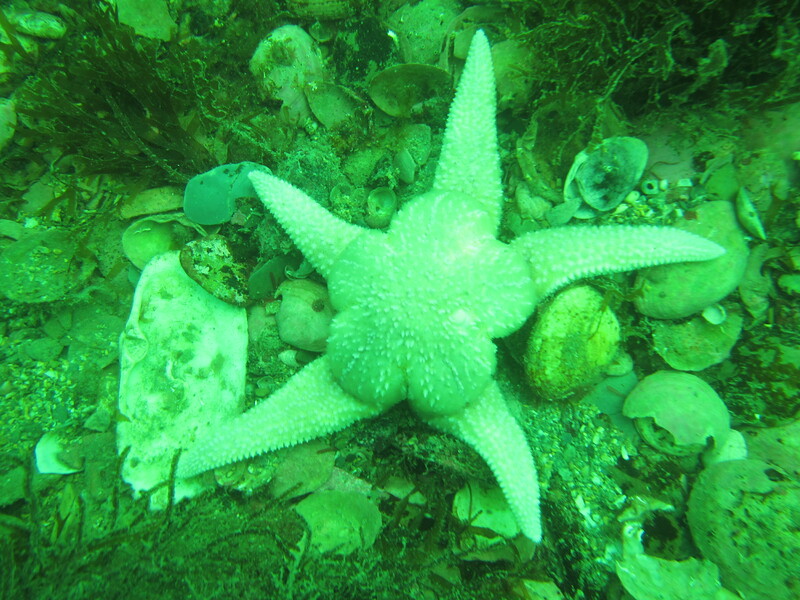 This entry was tagged Amphipholis squamata, Asterias rubens, brittlestar, Common ottershell, Common starfish, Dictyota dichotoma, Divided net weed, Dogfish, Dosinia exoleta, Great scallop, Harbour porpoise, Hardshell clam, Laevicardium crassum, Loe Beach, Lutraria lutraria, Mercenaria mercenaria, Norway cockle, Pecten maximus, Pullet carpet shell, Raya clavata, Rayed Artemis, Saccharina latissima, Scyliorhinus canicula, Small-spotted catshark, Sugar kelp, Tapes corrugata, Thornback ray, Venus verrucosa, Warty venus. Bookmark the permalink.